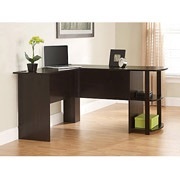 Walmart has an Ameriwood L-Shaped Desk with Side Storage Sale $70.32 Free Shipping or free in store pickup. Dark Russet Cherry is the sale color. Rated 4 out of 5 stars on over 400 reviews. Perfect for a student's room, a home office, even a corner of a guest room, the L-Shaped Desk with Side Storage provides a large work surface with two open shelves.